Vulnerability is often seen as a handicap, but it is also a fertile ground for innovation and experimentation - as evidenced by Gobeshona4. Photo credit UNDP Sweden. 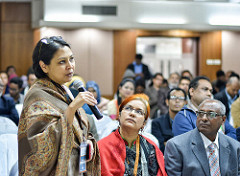 Promoting an abundance of expertise and research on climate change adaptation in Bangladesh, the Gobeshona Conference, held in Dhaka in January 2018, was a prototype for South-South, peer-to-peer capacity building and knowledge exchange. 11 January 2018: A familiar narrative is that developing countries, which are most vulnerable to the first and worst impacts of climate change, are often the least equipped to deal with it. This is only part of the truth. Resources, capacity and finances may be lacking in developing countries; but often they possess a wealth of knowledge, experience and research in how to adapt to a changing climate. Gobeshona (‘research’ in Bengali) is an innovative knowledge-sharing network, launched in 2014 by the International Centre for Climate Change and Development (ICCCAD) in Dhaka. The network capitalises on these assets, through research seminars, science-policy dialogues, an active web portal and an annual conference. The joint UNDP-UN Environment National Adaptation Plan Global Support Programme (NAP-GSP) joined a range of partners to support this year’s conference and to encourage peer-to-peer exchange between participants from least developed and developing countries globally. 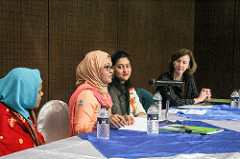 Bringing together scientists, young researchers, implementers, policymakers, international organisations, civil society and the public sector, the 4th Gobeshona Annual Conference for Research on Climate Change in Bangladesh (Gobeshona4) held from 8 to 11 January 2018 was a dynamic opportunity for Global ‘South-South’ learning. Bangladesh is grappling with an uncertain and perilous climate future. An upsurge in extreme events will continue to ravage rural and urban infrastructure. Climate-induced migration and displacement inevitably impact human security. Livelihoods, the economy and poverty rates are also predicted to be directly affected. But Bangladesh is also seizing the opportunities afforded by the challenge of climate change – to develop expertise and advance sustainable development planning. “‘Weak power’ is the capacity of a weak actor to transform its vulnerability into a comparative advantage. Bangladesh is one of the most vulnerable countries in the world. Vulnerability is often seen as a handicap, but it is also a fertile ground for innovation and experimentation,” said Dr Alice Baillat, Research Fellow at the French Institute for International and Strategic Affairs (IRIS), in the opening keynote speech at Gobeshona4. Local solutions and science/policy intersections were brought to the fore – with the aim to ‘build local climate knowledge’. Dr Atiq Rahman, executive director of the Bangladesh Center for Advance Studies (BCAS) spoke of the necessity to strengthen connections between dynamic science research and policymakers in Bangladesh, and to promote climate change adaptation capabilities and research more widely. “We have great expertise… having successfully learned to deal with [climate change impacts] at many levels through our own efforts,” said Rahman. Some examples include community-driven, climate-resilient agricultural methods and technologies, local adaptation methods for safe drinking water, urban initiatives to safeguard public health, demonstrable ways to increase livelihood resilience in the most vulnerable areas, lessons on responding to ecosystem loss and damage, and innovations in the renewable energy sector, amongst many more rich and valuable cases of applied research. The Paris Agreement reaffirmed that capacity building and climate education are essential to effectively implement climate action. As developing countries develop their unique expertise in-country, they are increasingly seeking to learn from each other about how to adapt. Adaptation learning has in the past been skewed towards North-South partnerships. But climate change adaptation is a burgeoning area for South-South cooperation. Knowledge hubs in the Global South, such as Gobeshona, are starting to reach out regionally and globally, to share adaptation lessons in a participatory way. “'Post-Paris, the global climate change status has been more focused than ever to build long term sustainable capacity to tackle the issues of climate change at all levels,” said Dr Saleemul Huq, Director of ICCCAD. At Gobeshona4, the agreement was reached to expand the network, and extend its influence to enhance adaptive capacity, through knowledge exchange and enrichment, prioritising knowledge which is being generated from the Global South. “The Gobeshona experiences and modality can be adopted to advance the capacity of young researchers in Ethiopia,” said Dr Zewdu Eshetu, Associate Professor, Climate Science Centre, African Center for Disaster Risk Reduction, Ethiopia. County-driven research is the foundation for effective, iterative adaptation planning. Much of this research is generated through universities in developing countries. Whilst they often face constraints of financing, lack of access to the international research community, and limited inclusion in policy dialogues or negotiations, academic institutions are often well-established knowledge hubs, with valuable resources. With the goal to foster a South-South collaborative network for enhancing research capacity and proficiency in climate change, the Least Developed Countries (LDC) Universities Consortium on Climate Change (LUCCC) is an initiative from ICCCAD and the Makerere University Center for Climate Change Research (MUCCRI). “This is a first-of-its-kind, LDC specific, South-South initiative for building climate capacity which will eventually enable all the LDC countries to take care of themselves on climate impacts, distinct from the prevailing monopoly on knowledge,” said Dr Mizan R. Khan, Professor, North-South University, Dhaka. The LUCCC, currently encompassing ten LDC universities globally, aims to develop common climate change-focussed research projects, whilst implementing teaching and training. The modality is ‘two-way collaborative capacity building’ – where Global South universities provide and seek support to advance mutual learning and capacity. At Gobeshona4, four LUCCC representatives attended to share experiences inter-regionally – from Bhutan, Ethiopia, Nepal and Tanzania. Supported by the joint UNDP-UN Environment NAP-GSP, these delegates brought unique perspectives and expertise, with the goal to unite global universities in climate change research and long-term capacity development. “South-South knowledge exchange is prioritised in the international dialogue on climate change, but the involvement of universities is limited. Developed nations feature strongly in knowledge generation and exchange, but this does not build knowledge assets in developing nations,” said Noah Pauline, Lecturer, University of Dar-es-Salaam, Tanzania. Pauline shared tangible experiences in advancing climate financing in Tanzania with other LDC representatives. Ajay Mathema, Managing Director and Associate Professor, School of Environmental Science and Management (SchEMS), Pokhara University, Nepal, demonstrated lessons learned in generating expertise in climate diplomacy and negotiation. “The LUCCC embodies immense potential for LDCs to share resources and training to prepare policymakers for climate negotiations,” he said. Developing countries are in the vanguard of adaptation planning and action. The scope for increasing opportunities for South-South learning is clear; such forums can provide useful lessons, technologies and ‘good practice’ examples for other developing countries tackling similar challenges. “By bringing the countries experiences together, through South-South cooperation, LDCs can conduct similar projects but on country specific challenges. This enhances the replicability and acceptability of proven and tested technologies,” said Eshetu. Climate change adaptation is an exciting new opportunity for South-South collaboration and learning. Academic exchange and ‘Southern-led’ knowledge forums can lay the foundation for effective global South-South learning, grounded in research and national/local experience. This in turn is the strongest basis for building capacity within LDCs to adapt to climate change. "Through sharing experiences of climate change adaptation best practice inter-regionally, we can raise the standard of national research for the purpose of knowledge acquisition and dissemination,” said Om Katel, Lecturer, Royal University of Bhutan. “We can collectively contribute to adaptation knowledge globally and work to enhance local resilience."